Upstairs totally refurbished....available for functions and parties !!! Downstairs renovations have just begun !! Have you got Google Earth on your computer? 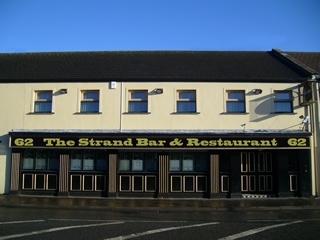 If so, then download the Google Earth view of The Strand Bar. Is this the wrong position for The Strand Bar? If you think so, then modify its position. Click / Tap the button above to get directions from where you are to The Strand Bar. What a night last night for the ireland match. The owner put on a free bbq and reduced prices on all the drink. The place was buzzing. Great craic, great staff and great food. A great time had by all. Beats saint matthews hands down. Looking forward to preforming fund raising event here on the last SAT...of Sept .2011...it will be a great night Very nice owwners and I wish them well. Very relaxed atmosphere at weekends particularly saturday nights. Group who play on Saturday nites are very good I think they are called Blarney. They cater for all tastes well worth listening to. have never been in the bar at all but have heard good remarks about it. the bar seems to cater for young people who when they have a few drinks feel like fighting the world-fights spill out onto the streets. also almost every weekend it seems like the dj who plays there is in my bedroom the music is thump thump thump the bar could do with some sound proofing. but i would still like to check this place out as everybody is talking about the lovely food and upstairs is perfect for parties. Upstairs is beautiful after refurbishment. Downstairs already underway, cant wait til its all finished!! Food great with excellent prices too!!! Cant beat it!Great place to go!!! Agree with previous comments made before new owner took over! Needs gutted out completely which is being done. Can't wait till its all finished. Our new local will be the place to go! If i had as many complaints i would not have went into it,i am glad who bought it,as long as he is left alone to run it himself,i think he will do a very good job. Good to see the place getting a clean. And Especially to see its in the hands of a GOOD FELLA and resident yeeee haaaaa. taken over by a well respected local man, already getting painted inside and out and hear new, more open window's are on the way!! !